Shop USA online stores & we ship to Australia! We ship to +100 countries in only 1-3 days with 80% lower shipping rates and full tracking. 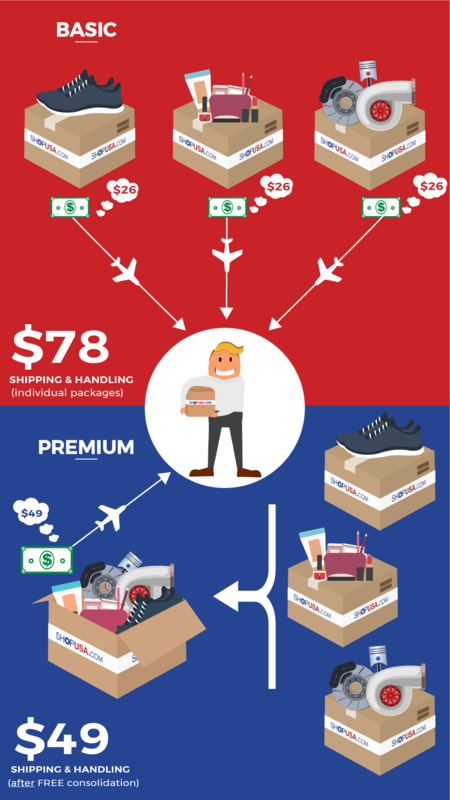 We ship to +100 countries in only 1-3 days with tracking to your doorstep and no hidden fees! 1-3 day delivery to +100 countries around the world. A really good experience! I thought it would be complicated and expensive, but it was really easy and a lot cheaper than I thought! Super service! Quick and efficient without any problems, how it should be! Great shipping prices! I shopped around to find the lowest one and ShopUSA was the winner. I got my package in less than 3 days. Amazing! Limitations: Packages over 150 lbs. in billable weight cannot be shipped via Express or Expedited. Packages over 44 lbs. in actual weight cannot be shipped via Economy. Surcharges: For Express & Expedited shipments, a large package surcharge of $71 applies if packages has billable weight greater than 90 lbs. and/or if (2 x width) + (2 x height) is greater than 130 inches. An additional handling fee of $11 may apply if any one side is greater than 48 inches, if second longest side is greater than 30 inches and/or if actual weight is greater than 70 lbs. For Economy, maximum size (length + girth) is 79 inches and maximum length is 42 inches.